Sajith as deputy leader: Will Ranil give green light soon? In twenty days from now, the Uva Provincial Council goes to polls in what is easily a litmus test before the upcoming presidential election. The major contenders, the ruling United People’s Freedom Alliance (UPFA) and the main opposition United National Party (UNP), are battling it out. The Janatha Vimukthi Peramuna (JVP) is also in the fray. For it, the task is to enhance its vote base after Anura Kumara Dissanayake took over as the leader. Ironically, at a time when one issue after another is falling on its lap almost every day, the UNP is in horns of a dilemma. It has its own issues. Its priority is not simply increasing the number of votes it would poll or even a push for victory.An equally important issue is the move to formally name Sajith Premadasa as the deputy leader. Winning the support of the party front-liners for this purpose has become an equal priority for UNP’s national leader Ranil Wickremesinghe. “We are still discussing the matter. A decision will be made soon,” he told the Sunday Times. His remarks reveal what is going on behind the scenes; so much so, the party campaign has become only a second issue. A formidable section of the UNP is strongly opposed to the move. Some of them have spoken out openly whilst the others have expressed their apprehensions privately to their leader. Among the issues they raise is the fact that the campaign for the appointment of Sajith Premadasa as deputy leader comes from outside the party by persons who are hand in glove with the UPFA. Ravi Karunanayake, who threatened to quit the party, went public. He even named one of the prime movers, Malik Samarawickrema, a former chairman of the UNP. He alleged that Mr. Samarawickrema was UNP by the day and UPFA by night. Among those who back the move to bring Mr. Premadasa as deputy leader are former MP Sagala Ratnayake and General Secretary Tissa Attanayake. Among those who are opposed to it are Leadership Council Chairman Karu Jayasuriya, Political Affairs Director Mangala Samaraweera and Parliamentarian Lakshman Kiriella. 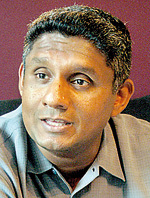 Protagonists for the move say that having Mr. Premadasa on board would help the UNP win Uva PC polls. None other than John Ameratunga, with close ties to both the UNP leader and the UPFA leadership, went public with those remarks. That Ameratunga voices his leader’s views is all too well known. 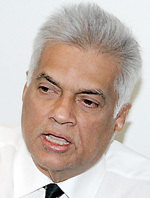 Now, the UNPers are waiting to see whether national leader Wickremesinghe would make an announcement when the party’s 68th anniversary ceremonies are held in Badulla on Sunday, September 6. Some say he would, whilst others argue that in the light of the opposition voiced, he would delay. If he does make an announcement, the matter would have to come for approval before the Working Committee of the party. Whilst all this brouhaha is going on, Mr. Premadasa is taking things quite easy. He has not set foot on election platforms in Uva. A lady MP, one of the interlocutors, told him to show his presence in Moneragala, where the chief campaigner Ranjith Maddumabandara was one of his steadfast loyalists, so the formal appointment would come. But he is staying put. His supporters say he is waiting for the appointment to come. It’s the chicken or egg situation now. Which comes first. So the UNPers are waiting to see whether Wickremesinghe will give the green light on Monday when the anniversary ceremonies get under way. If he does, Mr. Premadasa will be on board. If he does not, the haggling will continue. There is little time for the party to raise burning issues that concern the public. That underscores the ugly side of what was once the nation’s most respected political party. Just two weeks ago President Mahinda Rajapaksa was in Parliament for the Consultative Committee meeting of the Ministry of Finance and Planning. In the course of a discussion, he was prompted to remark that “you all call me Ekadipathi or dictator.” The reference was to the opposition parliamentarians who were present. Colombo District UPFA parliamentarian Thilanga Sumathipala quickly added that Mr. Rajapaksa was the first President to come to Parliament and spend time. Tougher laws are to be introduced to prevent the export of sweepings instead of quality tea. The move follows the discovery by the Tea Board following complaints from importers. They had said they were promised quality tea but had been sent sweepings. For this purpose, the Government has decided to amend the Tea Control Act No 51 of 1957. The island of Delft, off the Jaffna peninsula, is better known for the small population of wild ponies and roads with coral walls abutting them. One of the laudable actions of Douglas Devananda, who has nursed the Delft area as part of his electorate, was to install a fresh water supply scheme. He is not only the leader of the Eelam People’s Democratic Party (EPDP) but also a minister in the Rajapaksa government. With the project completed and the ceremonial opening, as important as the project itself due, Mr. Devananda went on an inspection tour. He was accompanied by S. Thavarasa, Leader of the Opposition of the Northern Provincial Council (NPC). The tower in the tongue-shaped island had a capacity of 60,000 litres of drinking water and had been built at a cost of four million rupees. Minister Devananda had utilised funds from his decentralised budget for the purpose. The ceremonial opening was due tomorrow. A proud minister and his officials watched as water was pumped to the tank. Then came disaster. The water tank collapsed injuring three persons. The minister and his staff escaped unhurt. An investigation is now under way. They are looking into see whether the contractor used the proper cement mixture. MR in Houston: Medical or astrological? Websites have gone viral over President Rajapaksa’s visit to Houston last week. Most of them banned in Sri Lanka, among others, have been vying with each other to claim it was on medical grounds. The imagination of some was so vivid that they even knew what the ailments were. A presidential source said the claims were baseless. The President had made a previous visit to Houston for a medical check. “There he received a clean bill of health,” said the source. The latest visit, the source said, was on astrological grounds. An advance security team had travelled to Houston ahead of the visit to carry out a routine check. He returned to Colombo on Friday night. While the Government and the Ministry of External Affairs are shrouded in controversy over the politicisation of a professional career service, the Foreign Service, now comes the news that two career officers have been recalled from an embassy in the Far East for threatening to kill a political appointee ambassador. What pits the Foreign Service has fallen into? The ambassador, one of the better political appointees of the UPFA Government, succeeded in getting that country to vote for Sri Lanka at the recent UN Human Rights Council sessions which saw a resolution passed against the Mahinda Rajapaksa Government. He had discovered a major accounting scam in the embassy and when confronted, the career officers, two of them, were reported to have threatened their boss. Probably a first time record in the Sri Lankan Foreign Service.